This Research examine the influence of financial leverage measure by Debt Ratio there are Degree of Financial Leverage (DFL), Debt to Total Asset (DTA) and Debt to Equity Ratio (DER) to the systematic risk (beta) of stock, and also examine the difference influence of thus debt ratio to the systematic risk (beta) of stock in normal period and in the global financial crisis in the year of 2008. This research use the data of firms in the manufacture sector which is listed on Indonesia Stock Exchange (Bursa Efek Indonesia) for the year of 2006 untill 2009. Using the purposive sampling method founded 87 firms for the sample. Research analysis use the panel data regression with General Least Square (GLS) method and 95% degree of confidence. RIZAL, Rahyang; PRINGGABAYU, Dematria. Pengaruh Financial Leverage Terhadap Systematic Risk Saham (The Influence Of The Financial Leverage To The Systematic Risk Of Stock). JAE (JURNAL AKUNTANSI DAN EKONOMI), [S.l. ], v. 3, n. 2, p. 1-11, sep. 2018. ISSN 2541-0180. 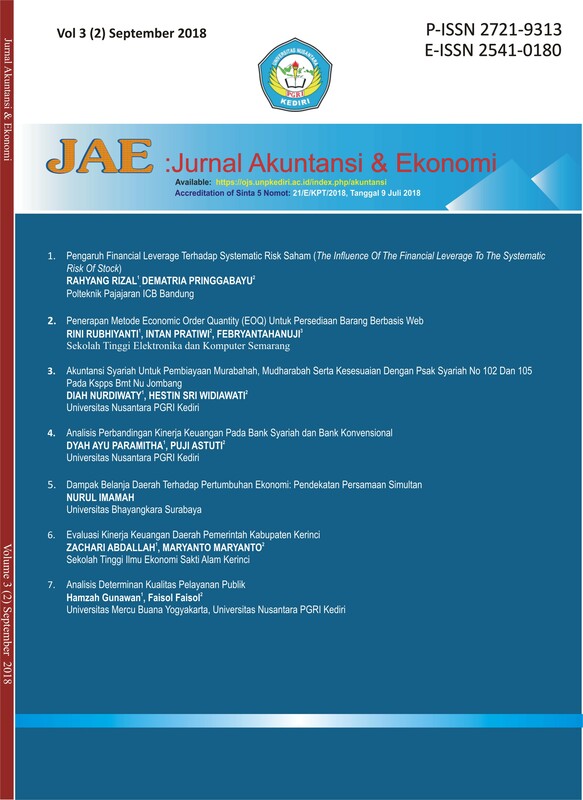 Available at: <http://ojs.unpkediri.ac.id/index.php/akuntansi/article/view/12503>. Date accessed: 24 apr. 2019. doi: https://doi.org/10.29407/jae.v3i2.12503.